It is nice to have directions in our pilgrimages. 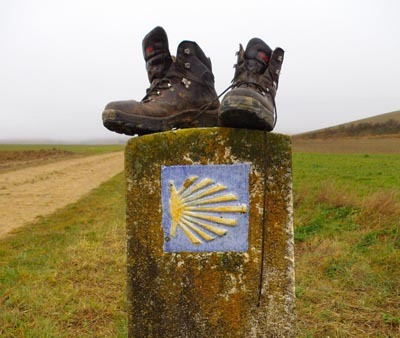 I have a friend that just walked part of The Camino in France and Spain on his way to Santiago. 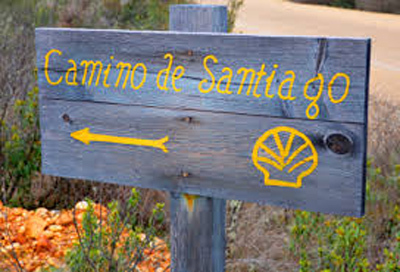 In support of his journey I watched the documentary film about this pilgrimage called, Walking the Camino; 6 Ways to Santiago. I prayed for him as he traveled, requesting that his journey be a personally meaningful experience for him. 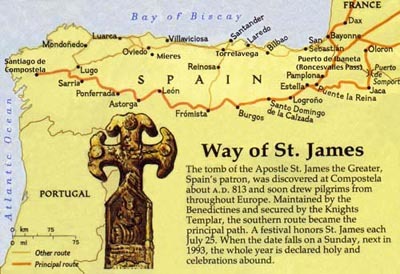 Pilgrimages, I have learned, are wonderful journeys undertaken as a quest or a pursuit to find or obtain something. Often they help us to get in touch with God and "His" purpose for our life. How important it is in today's busy world, when it is so easy to forget the real meaning of our lives, to take time for such pilgrimages. This pilgrimage, like our lives is often a rather lengthy journey! Take time to enjoy the scenery along the way. 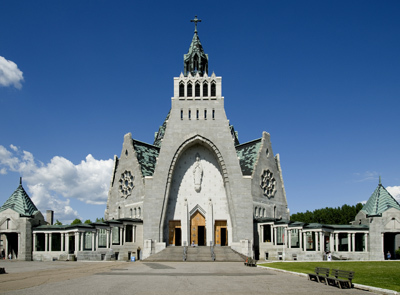 Years ago I used to take a yearly pilgrimage to the eastern Canadian Catholic shrines. An elderly Catholic woman made it her life's work, in gratitude of a healing she had received, to arrange a three day, two night pilgrimage and gathered any interested Catholics from parishes in the state to fill a tour bus. We would go "off-season", which decreased the costs of our lodging. 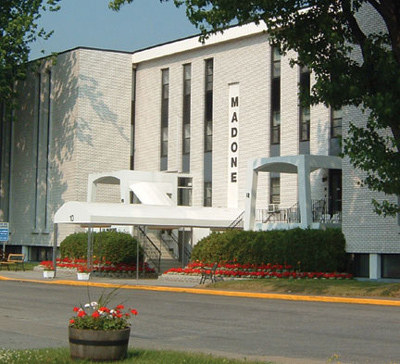 She arranged for English speaking masses and other devotional services, as well as scheduling our lodging accommodations at the Madone House at Cap de la Madeleine at Trois-Rivieres, Quebec. The pilgrim accommodations across the street from Cap de la Madeleine. I heard about this pilgrimage through my participation in a Catholic Women's Guild at my church. Several women started telling stories of their experiences while on this pilgrimage. It was clear listening to them that they enjoyed their trip so much that they returned year after year. I couldn't wait to sign up! Though I went by myself the first year, I wasn't alone. A few of my friends from church were there and it was a real opportunity for me to meet and make new friends. I was assigned a bus seat mate/ roommate, and I had a great time! My husband supported me by taking over with the kids and driving me to the location where we were to board the bus and then picking me up afterwards. 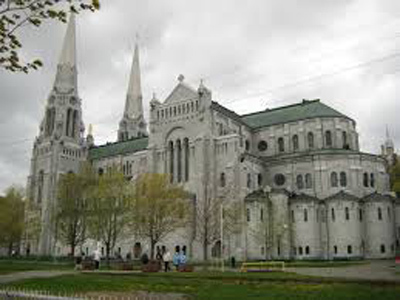 This pilgrimage stopped at The Shrine of the Sacred Heart in Montreal, where resident monks greeted us and lead us through their outdoor Stations of the Cross. One of my friends pointed out the curled toes of their sandals as they spent so much time on their knees praying. This is a picture of Father Frederick. "Our Lady of the Cape" statue at the Rosary Church at Cap de la Madeleine. We then stopped on our way to Cap de la Madeleine in Quebec to visit the museum and tomb of Father Frederic, one of the priests most instrumental in establishing what has now become the old Rosary Stone Church there. 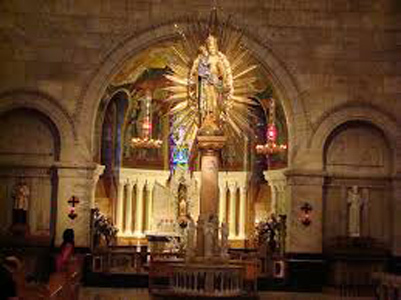 Being a Catholic convert, I had no idea how much Catholics revere tombs and relics of those they consider to be saints! They also love stories about modern-day miracles! Miracles were have said to have happened at the Cap de la Madeleine during the time when missionaries were establishing the church there. The river is said to have iced-over at a rather unseasonable time so building materials could be transported over the river to build this church. 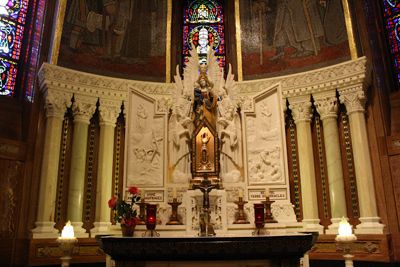 Later the beautiful statue of Our Lady of the Cape was said to have opened her eyes, and another time shed tears. 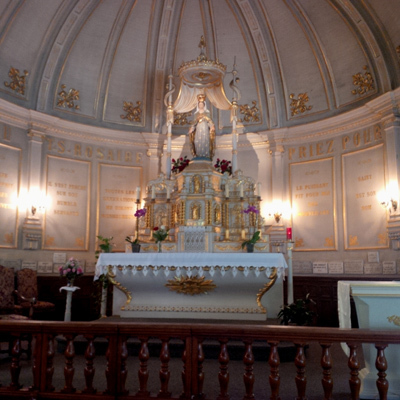 It is now the location of not just this beautiful little Rosary Church but the Baslique Notre Dame du Cap. Baslique Notre Dame du Cap (Our Lady of the Cape). 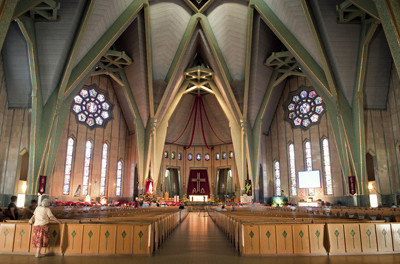 The inside of the Baslique Notre Dame du Cap. 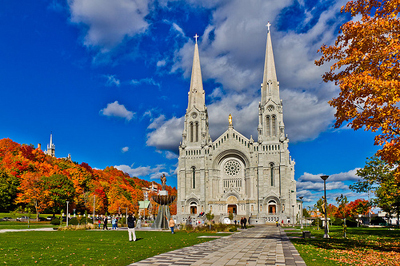 The following day we would take a full day's trip to Saint Anne de Beaupre! 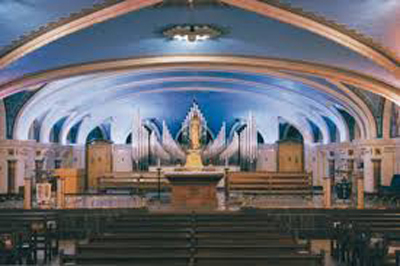 Its lovely chapels, statues and artwork are more than inspiring! Many other religious buildings surround this beautiful church and each is steeped with stories of the many healings that took place there! On the hillside surrounding St. Anne's are little French gift shops as well as a special French auberge that became a most welcome place to sit and rest our feet while having a nice warm lunch. Rounded structures back of St. Anne's are small altars behind the main altar. Main statue of St. Anne holding her child, Mary in front of one of the altars. 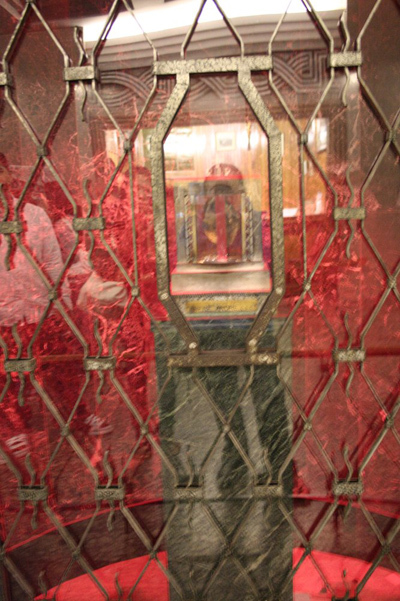 This is the altar where St. Anne's holy relic (arm bone) is displayed. The ceilings of each of the smaller altars is done in beautiful mosaic work. 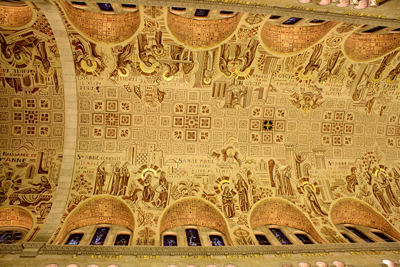 This is the ceiling of St. Anne's, a lovely mosaic depicting the life of St. Anne. 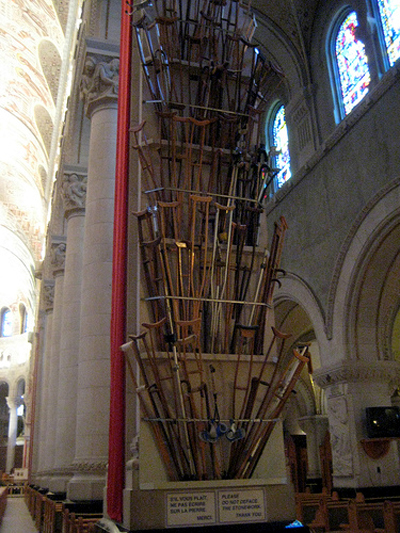 Crutches left behind by people that were healed at St. Anne's. 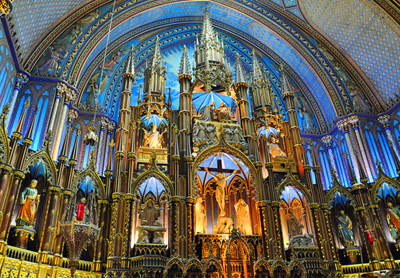 The Interior of St. Anne de Beaupre showing the main altar. Scala Santa, Holy Stairs to be taken on your knees while praying. Very hard!! 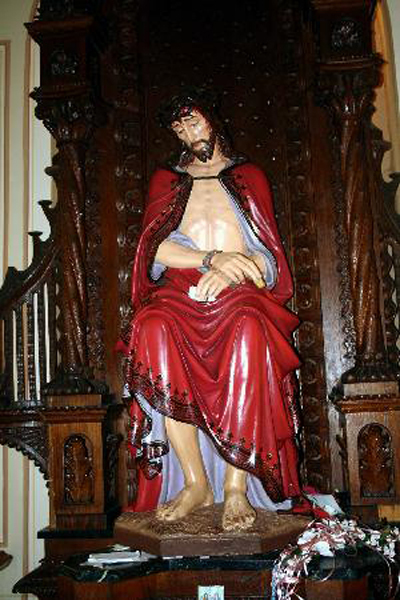 My young daughter left her picture at the feet of this statue of Jesus. 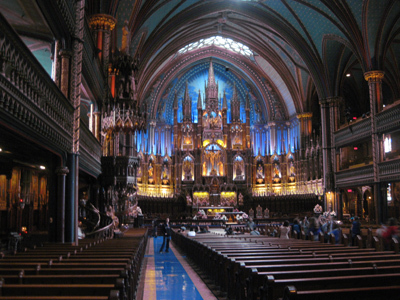 Many do..
On the last day we would return through Montreal and stop at Notre Dame Cathedral. 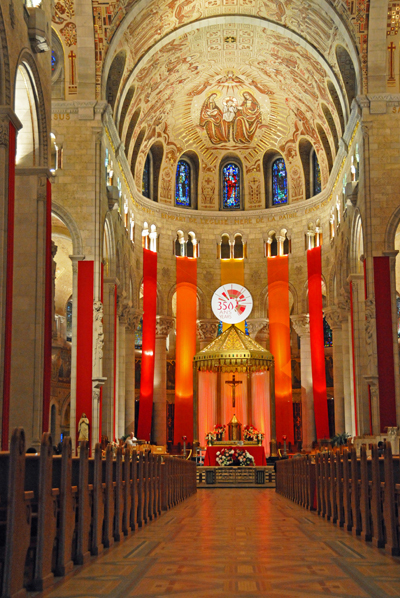 It is one of the most beautiful cathedrals I have ever seen. It is no less than breath-taking! 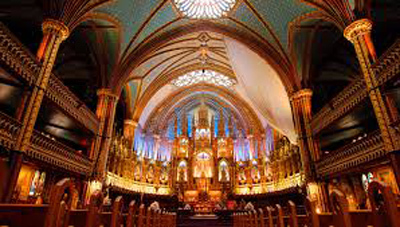 Notre Dame Cathedral in Montreal, breathtakingly beautiful! Same picture with different lighting. 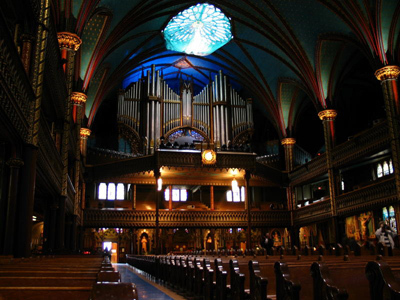 The back of Notre Dame Cathedral in Montreal. We would then go on to St. Joseph's Oratory where we spent the rest of the day visiting the tomb of Brother Andre as well as the rest of the Oratory. Brother Andre is now a celebrated saint. 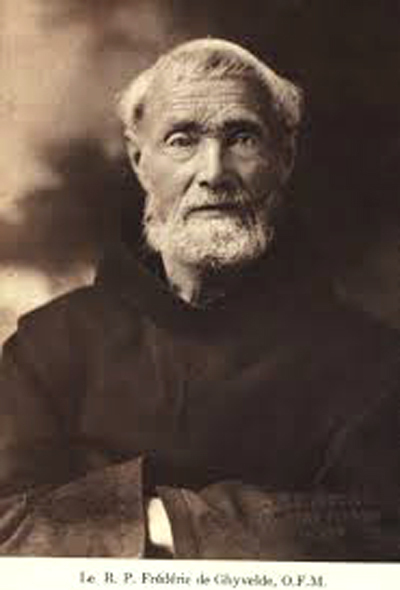 He was a simple man, who due to lack of education and skills became a simple doorman at the Oratory and greeted the many visitors.Taking his job quite seriously he would pray for those that had come, by requesting the intercessory prayers of St. Joseph while blessing them with the special "Holy Oil of St. Joseph". Pilgrims soon noted that Brother Andre blessings and prayers seemed to have healing power. 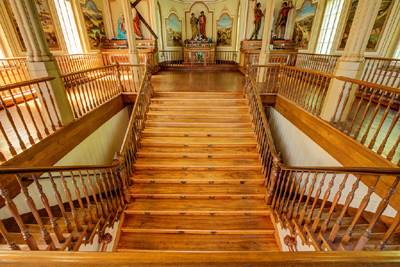 It wasn't long before a special station was needed to accommodate all those who came to be blessed by this humble and holy man. Again walls of crutches and braces were left behind by people who had been cured. 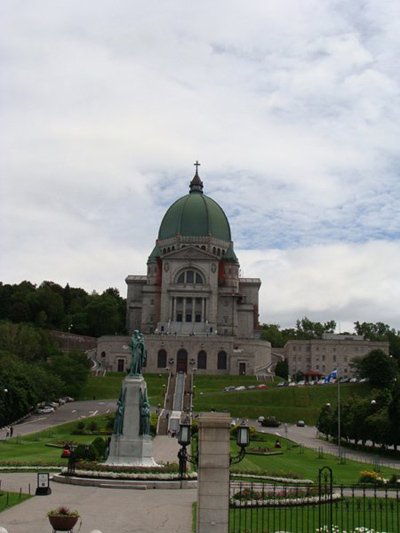 St, Joseph's Oratory, Montreal, Canada. 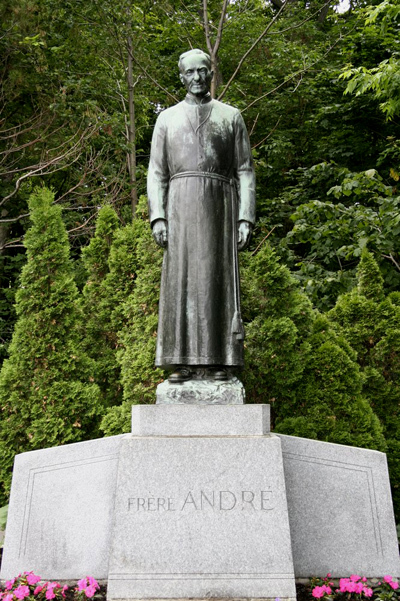 Statue of Brother Andre, now officially canonized a saint. 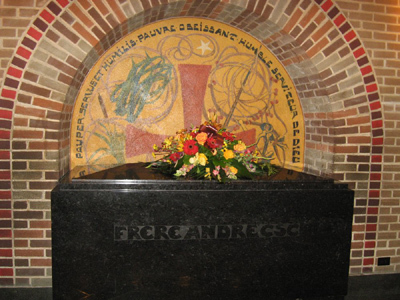 The tomb of Brother (Saint) Andre. The actual heart of Brother Andre at the Museum of Brother Andre. 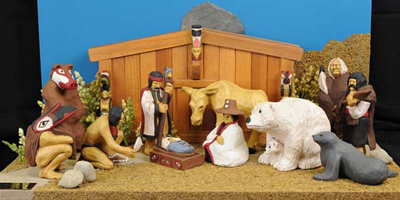 Saint Joseph's Oratory is now home to a unique international creche collection. It is so beautiful to see the Holy Family done to match every skin color and culture!! 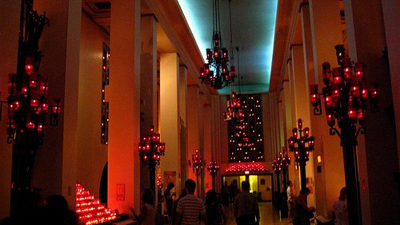 There is also a special Hall of Lights that is lit and warmed simply by the many candles lit there, in remembrance of special prayer intentions. One of hundreds of special creches from all over the world. 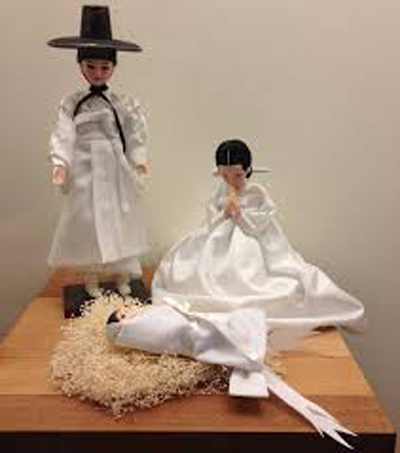 Each creche depicts The Holy Family in their own culture. Hall of Candles is lit and warmed by candles. 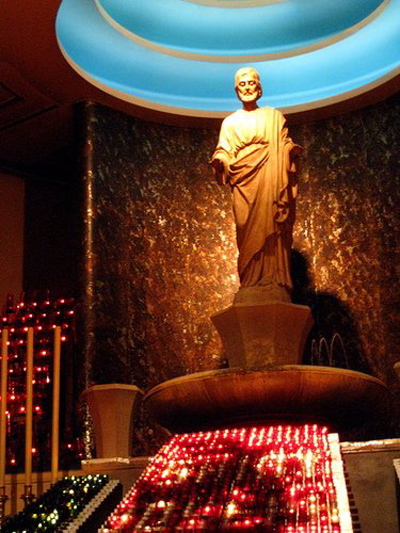 Statue of St. Joseph surrounded by votive candles. Renewal was the purpose of our trips and though each trip was essentially the same, every one was different according to the changing needs that we brought with us. Enlightenment came in different ways as. We always returned home tired, but re-inspired and ready to live out our faith in fresh new ways. Each of us was strengthened to face whatever life brought us. Sharing our own personal stories and ways that we had been blessed brought encouragement to others and became bonds of friendship. We were filled with new appreciation of God's love for each of us. I never returned empty-hearted or empty-handed either. Souvenirs filled my bags: books, prayers, statues, prayer beads, all blessed but best of all were the stories of my trip! It was as though I had been in a time warp. Despite being gone for such a short time, our pilgrimage had taken us to a bit of heaven and we returned happy and "centered" in our faith. 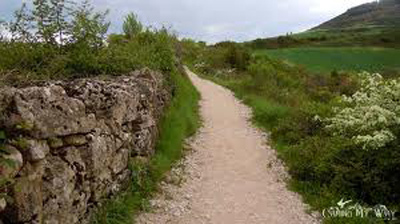 As I read One Million Steps, the story of one person's Camino journey, in support of my friend's pilgrimage, I realized that each of our lives is a pilgrimage. A person doesn't have to leave home, to make a pilgrimage, though they are truly wonderful opportunities. Any of us can take the time to reflect and pray for a renewed spirit and draw closer to God. While our lives are filled with the seemingly small and mundane commitments, we can choose to view them as "steps in our life's pilgrimage". Whatever we live-out and lift to God in our everyday life becomes "our personal and Holy way" to God. 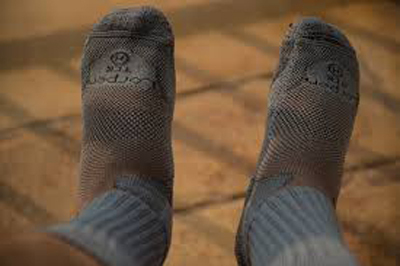 Pilgrim resting his tired feet during his Camino Pilgrimage. 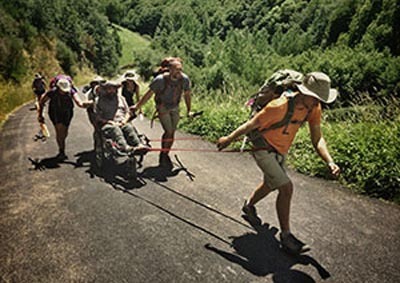 Pilgrim in wheelchair being pushed by his best friend and helped by others too! Camino sign with well-worn boots. Our bodies often become like these boots! Pilgrimages are about perseverance and patience, asking and thanking God and taking time to recognize the many blessings we receive as we journey through life. The very actions of our everyday life, be it loving our spouse, mothering our children or grandchildren, caring for an ailing relative, pursuing a career or just being there for our friends or neighbors and/or doing the various tasks we undertake in our jobs are ways that we can honor God. Needle-arts, my way of meditating. Each stitch a step in my pilgrimage. Needle-arts fits right into these sorts of meditative practices. 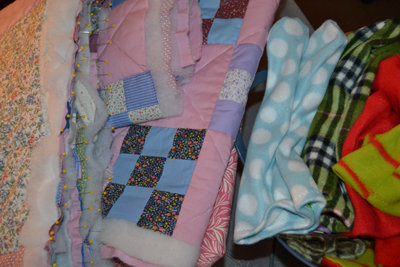 Making stitch after stitch as we create a quilt or crochet or knit an afghan, or scarf is no different. Every activity we undertake can be "our way" of connecting to our creator. I have a little sign over my sewing table that reads, "I saw that. (signed) God". I laughed when I saw this thinking that He IS indeed watching over my sewing. I have come to realize that while no one but God can make or do anything perfectly, it is my job to do my best and thinking of God sitting right there on my shoulder, along with my mom, watching my every stitch or action is a way of making me accountable to not do less than I am capable of doing. There is much truth to the old adage that "anything that is worth doing is worth doing well". It is part of our life's pilgrimage to be all we have been created to be. Mother Teresa taught her sisters that "doing small things with great love is" what our lives are all about! It is important for me to remember that even the smallest task done well is of consequence to God. However much I plan and scheme and rush about, I need to also appreciate that my life is a marathon, not a sprint! It is about taking time and pouring my heart and love into each day's goals and accomplishments, however small. While taking deliberate journeys to sacred places can be very transforming, pilgrimages aren't so much about where you go, as much as they are about taking time to reflect and re-fresh our perspective where ever we may be. Our life's pilgrimage takes place wherever we are and opening our hearts in our work and relationships is what makes our pilgrimages satisfying and rewarding,.. thanks be to God! This blog is dedicated to my friend, S.N, and to my readers, with a special prayer that their life's pilgrimage be filled with purpose and joy! 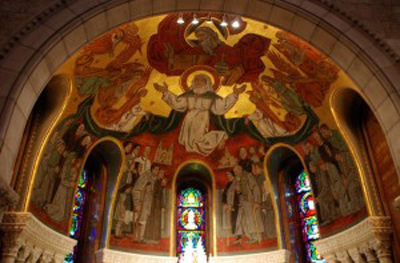 (Note that these pictures are not my own, but rather pulled from images on line at these various pilgrimage sites. I credit the individual photographers for inviting us all to take whatever sort of pilgrimage best suits us. I especially appreciated the picture of the pilgrim in a wheel chair. I took a friend of mine in a wheel chair on one of my pilgrimages. I am not so very strong myself, but miraculously a bee flew up my dress and stung me several times...bee sting therapy can eliminate pain, and so I miraculously had little discomfort on that trip and my joy doubled to share it with my dear friend, besides which, we got access to special places that I wouldn't have otherwise seen! Labels: Different Kinds of Pilgrimages; Seeking The Holy in the Ordinary; Mo. Teresa's saying: "doing small things with great love".